I realised at the beginning of this week that somehow, I had forgotten to have fun. My work is so engaging, enjoyable and fulfilling (working with children (heart), writing (mind) and yoga (spirit) ) that I fell into the trap of thinking that work was the same as fun. It’s not. I became aware that something had gone awry on Sunday afternoon, when the Bear, sick to death of my foul mood, packed us all up and took us to the beach. It was stinking hot at home in the valley where I live, but at the beach, the cool sea breeze lifted all of our spirits. The kids rode their bikes up and down the long break-wall that juts out into the water, and then we tossed ourselves into the crystal clear ocean. The currents are still cold this time of year in contrast to the air temperature, so when I emerged from the water, I forgot that I had ever been hot. While we were swimming, the Bear had gone and bought dinner, and we sat at a picnic table in the dwindling day and ate our fill. We were out for about 4 hours, and I was completely transformed. Today, I had an hour to spare before work, and I decided to read my novel (yes, novel!) on the lounge with a cup of tea. I knew I might have been taking things a bit too seriously when I was so excited to be reading a novel in the middle of the morning I could hardly contain myself :). Woman, you haven’t been playing enough. You’ve become all dried up and cranky because it’s all been about work (which is very enjoyable, meaningful and fulfilling), but you need to play more! Note to self: yoga and writing, although enjoyable activities, are not play. Cleaning the house, cooking, shopping and kids activities are not play. Work – although fulfilling – is not play. Got that little Miss Serious? What Gets Us Into Trouble – by Jennifer Pastiloff on the Manifest-Station. Just like that, I heard in my mind The Practical Mystic, and I thought, yes, that’s me! Trying to make the everyday sacred is what I do. But how can I use it? I can’t change the name of my blog – that would be too confusing- or would it? So, I sat on it for a month. I changed the name of my twitter account first, just to see how it felt – and then I felt pretty bold, actually 🙂 so I changed the name of my blog as well – same address, different name. And then I thought, damn, my new name doesn’t go with my old blog theme anymore! So I changed that too 🙂 What do you think? So, this week, I asked myself: how do I want to play? This is what I came up with: for six whole, lovely hours on Tuesday, I put aside my writing work and…read my new book, bought specially for the occasion – in between episodes of the fifth series of Downton Abbey- and watched the birds play in the bird bath. That’s it. Nothing was accomplished nor did it need to be. Sooo good people, sooo good :). 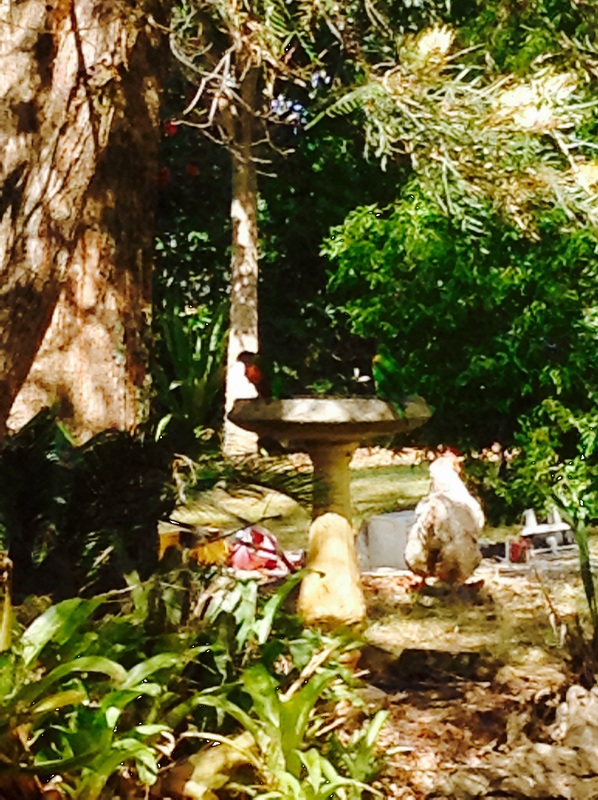 Twp rainbow lorikeets frolicking in the bird bath, along with a photo bombing chicken. 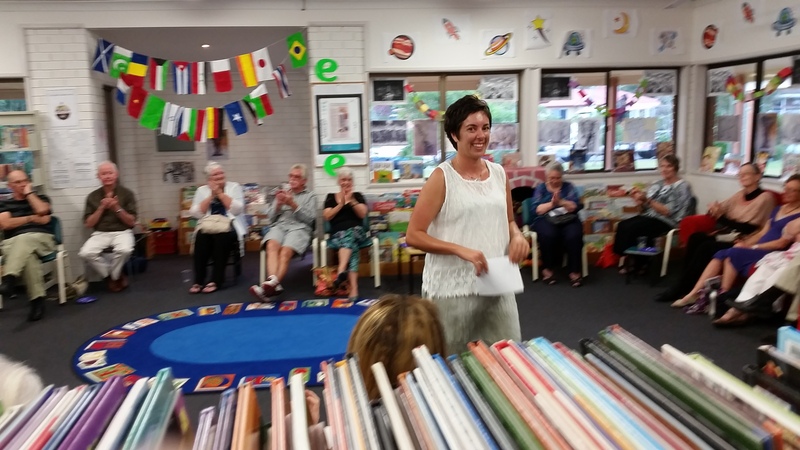 Last night was the launch of my writer’s group 25th anniversary anthology – Stepping Off a Cliff Naked. A piece I wrote last year was selected to be in there – oh man, it’s exciting to be published, in a real live book, but I can’t read that piece – I just wince and look away. 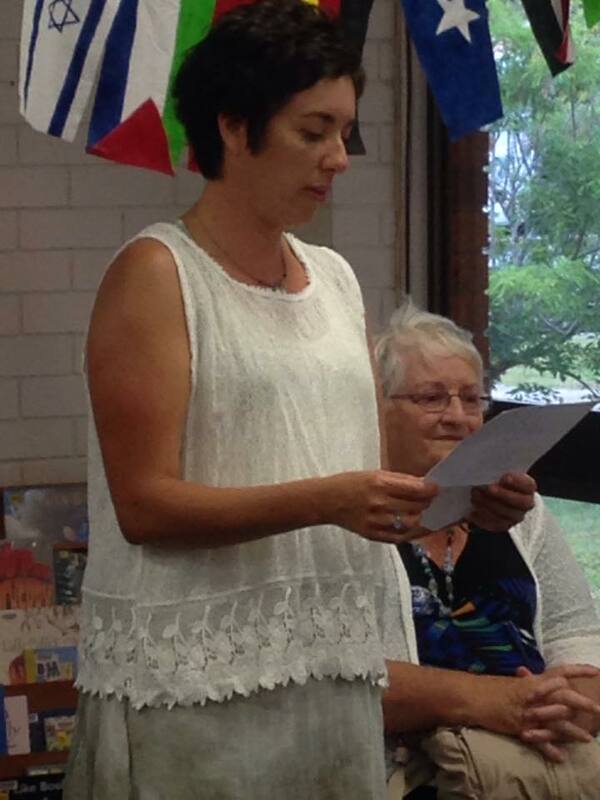 Apparently this is quite normal I’m told – and I was also asked to read my poem, The Rainmaker. Reading out my work, and indeed most public speaking is terrifying for me, but I was asked to do it, and I know I can do hard things :). I also knew that I had been doing lots of work over the past few months on my throat chakra to help me with this very issue – and it was time to give it a run. Through the week I practiced reading it, doing my best wonder woman stance – and rather than getting nervous, I was feeling excited. Strange! Finally, I’m standing up there in front of 50+ people, reading my rather intimate poem – and I feel good all the way through it. I speak it just how I have been practicing – and people love it! A new era? Let’s hope so 🙂 As my writer’s group friend Roby said – you are so brave Sara, and you used to be such a wuss! Sara, the new name and layout match your blog beautifully! 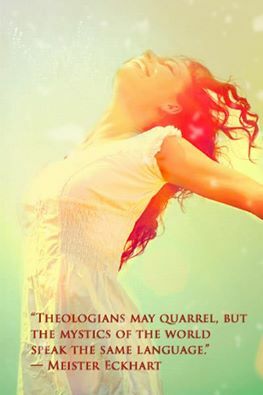 And isn’t it amazing how some fun rounds out who we truly are? I try to inject some into my life as well….my home yoga practice sometimes turns into a home dance party– I just follow my body where it wants to go… PS: did you say that last eclipse was in your first house? This is very inspiring. I enjoyed it immensely today. Thank you for the reminder to go play. It is exactly what I need! Ah, thank you Millie 😊 I think most of us get the balance a bit wrong from time to time. Have fun playing this week! You did well. It was lovely to hear your poem again, and that’s definitely the look of ‘nailing it’ and relief when you walked off. Thanks Diane, it was such a good feeling 😊 especially to have actually enjoyed the process! Amazing. LOVE the new name (it suits YOU); love the new look, and love the positive acknowledgments here. Really great to see your journey play out, Sara. I remember first finding you in my comments… and watching all the progression and evolution has been wonderful. Mazel!